. Akiu Otaki 秋保大滝 Akiu Great Falls .
. Fudo Taki 不動瀧 and Gongen Taki .
. Ibigawa Fudo Waterfall 揖斐川町 Gifu .
. Imakumasan 今熊山 Tama, Tokyo .
. Myooken no taki 妙見の滝 Waterfall of Myoken Bosatsu . 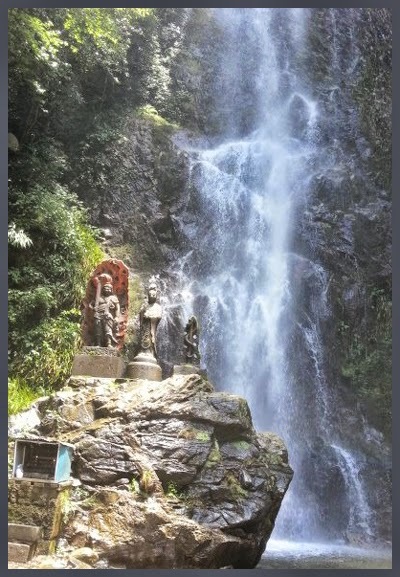 In the year 701, this waterfall has been established officially 大宝律令 to heal mentally instable people 精神障害者. 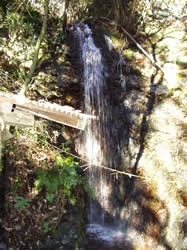 There used to be at least seven waterfalls of the river Shakuji-I gawa 石神井川, also called 滝野川 in Edo. People came here in summer to feel the cool, have a snack and relax. 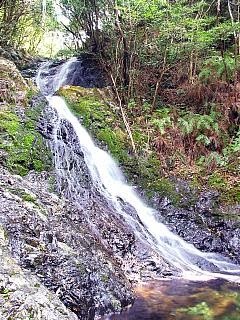 Now part of Nerima ward.
. Edo no taki 江戸の滝 waterfalls in Edo . 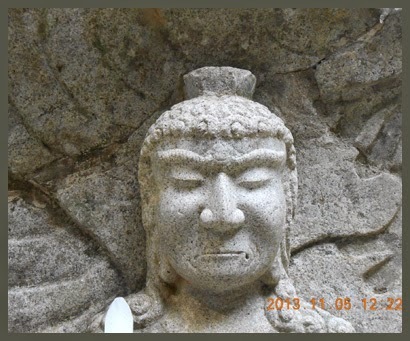 The statue of Fudo 滝不動尊 is now preserved at the temple 正受院 Shoju-In. CLICK for more beautiful photos !
. 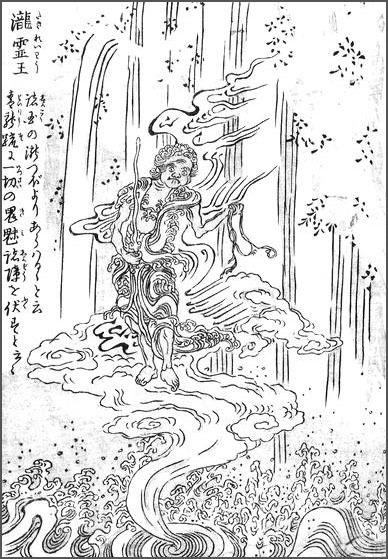 Tatsuzawa, Tassawa Fudo on Taki　達沢不動滝 . 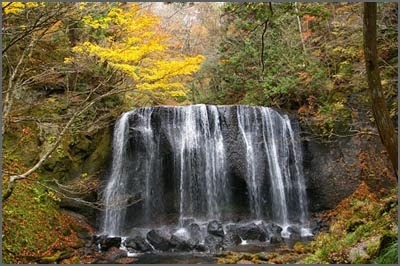 Long list of the location most Fudo Waterfalls in Japan. They are sorted by province. I will introduce some more later.
. . . CLICK here for many more Photos 瀧不動 !
. . . CLICK here for Photos of the waterfall !
. . . CLICK here for Photos of the Waterfall!
. Fudo on Taki　達沢不動滝 Photo Collection .
. yōkai 妖怪 Yokai monsters - ABC-List . 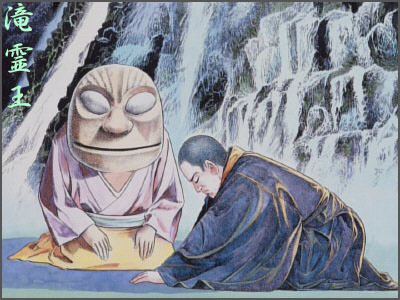 There are many waterfalls in Japan, where this Yokai appears..
One is mentioned in the 青竜疏 Blue Dragon Commentary by Saicho. 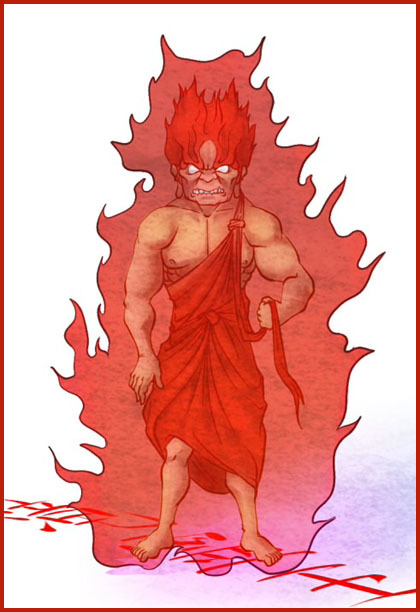 It is not really a Yokai, but seems to be Fudo Myo-O himself.
. Saicho, Dengyo Daishi 最澄 伝教大師 . (766 - 822) - established the Tendai Sect. 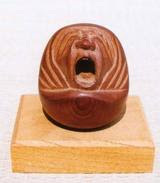 Once the priest 相応和尚 So-o of the temple 葛川息障明王院 Katsuragawa Sokusho Myo-O In Myo-O In in Shiga found a 霊木 divine tree in the waterfall basin and carved this statue of Fudo Myo-O out of it.
. 建立大師相応和尚 Konryu Daishi So-O Kasho . The statue of Fudo is a secret statue and only shown on the 28th day of the 8th month.
. Kurikara, the Sword of Fudo Myo-O . There is a legend of the water fall. After Revolt of Hogen Heiji( 1156-1159), Many Ochimusha (落ち武者；Defeated soldiers fleeing the enemy) fled and came to Tsukechi Valley. And they built a temple . Chisho( 智澄) who was a super extra high rank monk was the temple master. He was a monk who was a veterinary expert. he seemed to be stingy with money.He had much coins in his temple. When He was 74 years old, he was killed by the village people. I think, only he was rich. Many villegers were poor. So villegers vented their frustration against Chisho monk. After they killd Chisho, Villegers threw his body from a bridge at the lower part of a river..
A strange thing happened to Monk’s body. 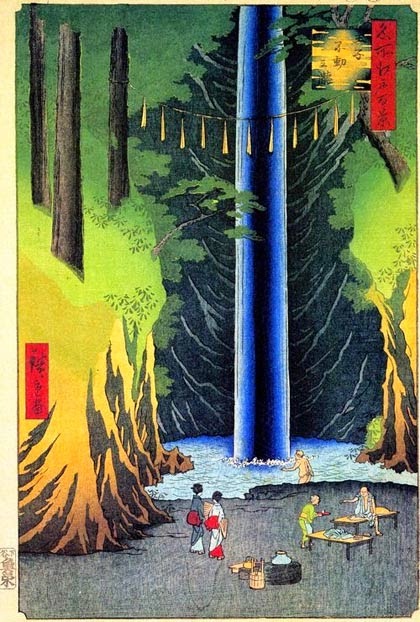 The Monk’s Body went up the river and arrived the waterfall. For a while , Monk’s body ( it is said that is was only Monk’s head) was turning around under the waterfall. After the Monk's murder , people who are responsible for Monk murder have had misfortune or mysterious death. 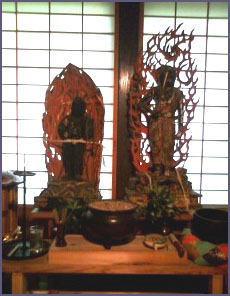 It is said that Fudo Myoo statue was built in order to soothe Chisho ‘s vengeful spirit . Because Fudoo Myoo beats all bad spirits. 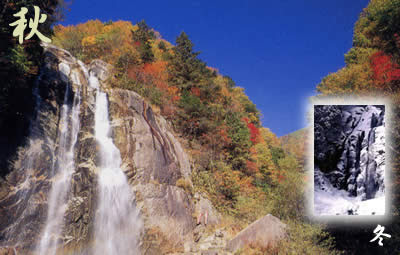 Kurotaki 黒滝 / 黒瀧 "Black Waterfall"
In the Nakano gorge is a waterfall dedicated to Fudo Myo-O 不動の滝. Kobo Daishi passed here and exorcised a huge serpent from the waterfall. Nearby is now a temple in honor of Fudo Myo-O.